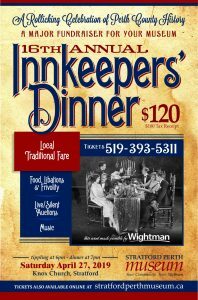 The signature fundraiser for the Stratford Perth Museum is our Innkeepers’ Dinner. It is Saturday, April 27 at Knox Church. Tippling begins at 6 p.m., with an outstanding dinner at 7 p.m and an excellent live and silent auction following dinner. Tickets are still just $120, including HST and a $100 tax receipt. Tickets available at the museum, and online by clicking here! And this year there the fun continues at the after-party next door at Mercer - just $20. Click After Party for tickets!